The discovery of Victoria Falls is one of the milestones in the annals of history. This is the description Dr Livingstone was able to coin so flatteringly when he ventured onto the lip of the falls on “Kaseruka” Island, now named after him. The year was 1857 two years after his discovery of Victoria Falls. Dr Livingstone named the island “Garden Island.” This island is the largest on the Zambezi above the falls. The Ba Tonga people once used the island a chief’s royal burial ground. Therefore, it’s a sacred spot for worshipping their deities. Today there is no sign of the garden on Livingstone Island. Being the only regular visitors the elephants have wreaked havoc and spread destruction on the whole island as only elephants can do. The falls is awesome. At the “peak floods” over 550,000 cubic metres of water per minute or 9 million litres per second, cascades over the cliff of the waterfall. A record flow recorded so far was 700,000 cubic metres per minute that occurred during the flood of March 1958. The flood destroyed the Kariba Dam wall under construction downstream near the Kariba George. 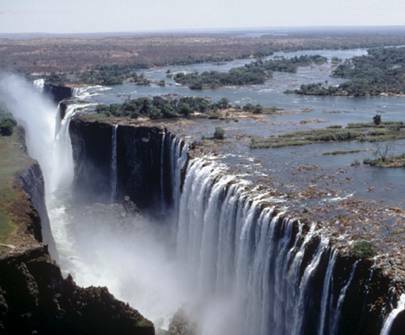 was formed by the wild Zambezi, Africa’s fourth largest river. Zambia is named after the Zambezi River. Its source is in Northwestern Zambia at Kaleni Hills. 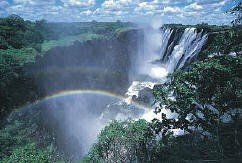 It discharges its water into the Indian Ocean after traveling 3500 km and in its path it has created two cataracts: the Victoria Falls and the Cabora Bassa Rapids down stream in neighbouring Mozambique.